While working on the Utrecht update, I am getting a number of useful bug reports from users which help to improve the sample set. However, I have also got a "bug report" from a user who was demonstrating to me high amount of distortion and noise in the sample set. I started the investigation of the problem and this is the result: you should always try to load the sample set at least in 20-bit resolution. 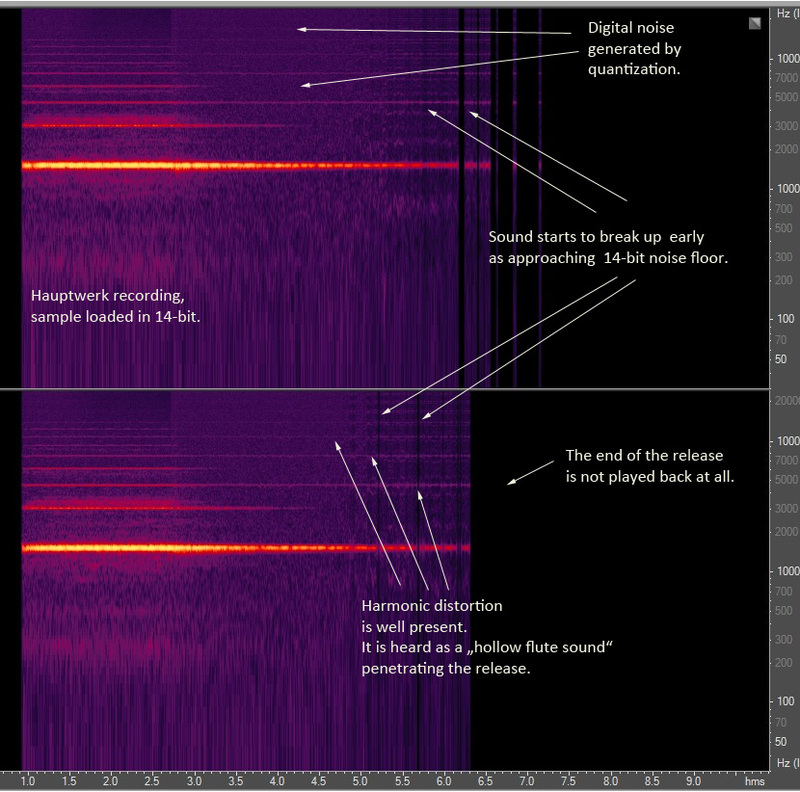 If 16-bit sample depth or even 14-bit depth is used, the results may not be entirely musical. 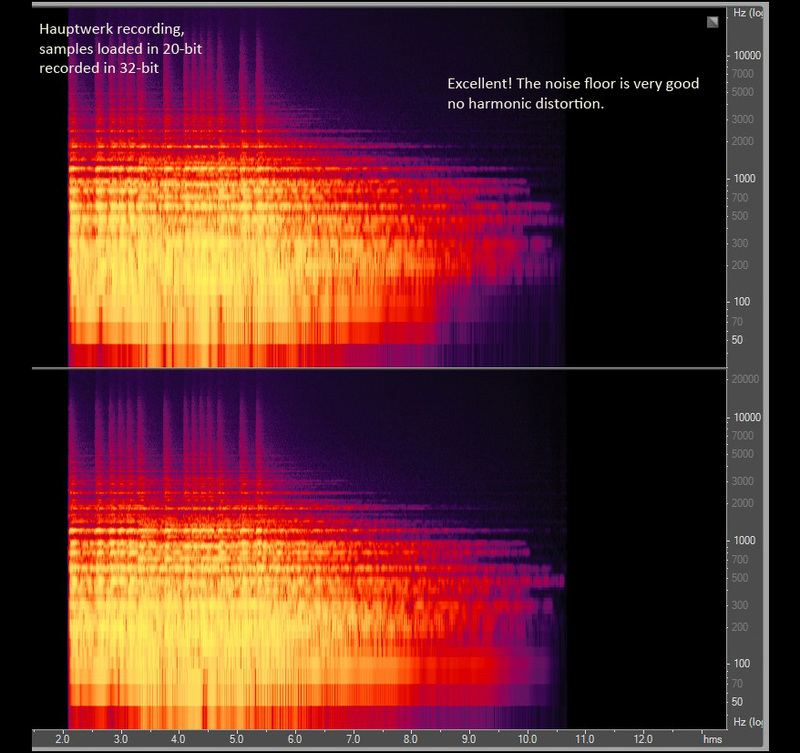 The harmonic distortion and quantization hiss (noise) manifest themselves in large amount (especially in 14-bits) due to the downsampling, and the quiettest portions of the audio break up due to the high noisefloor of the 16-bit or 14-bit sample resolution. I cannot recommend loading my sample sets in 14-bit resolution and the 16-bit depth is only "sufficient", but not "excellent". Small demonstraion follows. The example below uses only three stops: Prestant 8, Hohlpipe 8 and Octave 4 of the Utrecht Rugwerk. 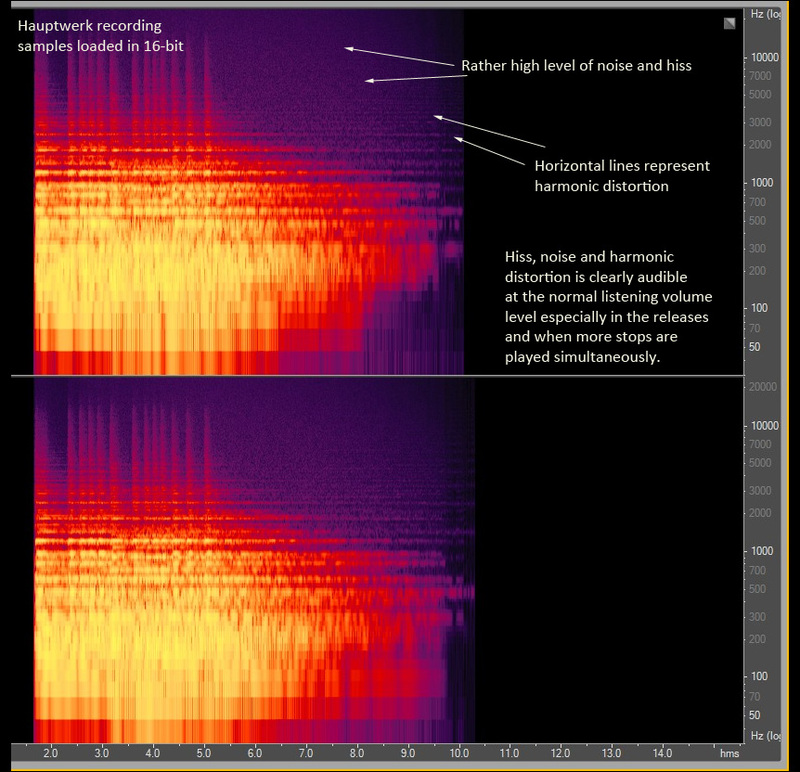 A repeated chord is played in various bit resolutions and the results are given below for direct comparison, together with a spectral visualization of the audio recorded through the Hauptwerk internal recorder. The black areas in the visualization represent a digital silence, the more color - the more sound (hiss is usually violet, audio signal red or yellow). The vertical axis is logarithmic (Hz), the horizontal axis represents the time. The recording was done with the Hauptwerk v 4.0 and interpolation disabled, so that any interference from the Hauptwerk repitching algorithm is prevented. (See other post to view and hear the influence of the repitching without the proper filtering on the quality of your Hauptwerk audio). 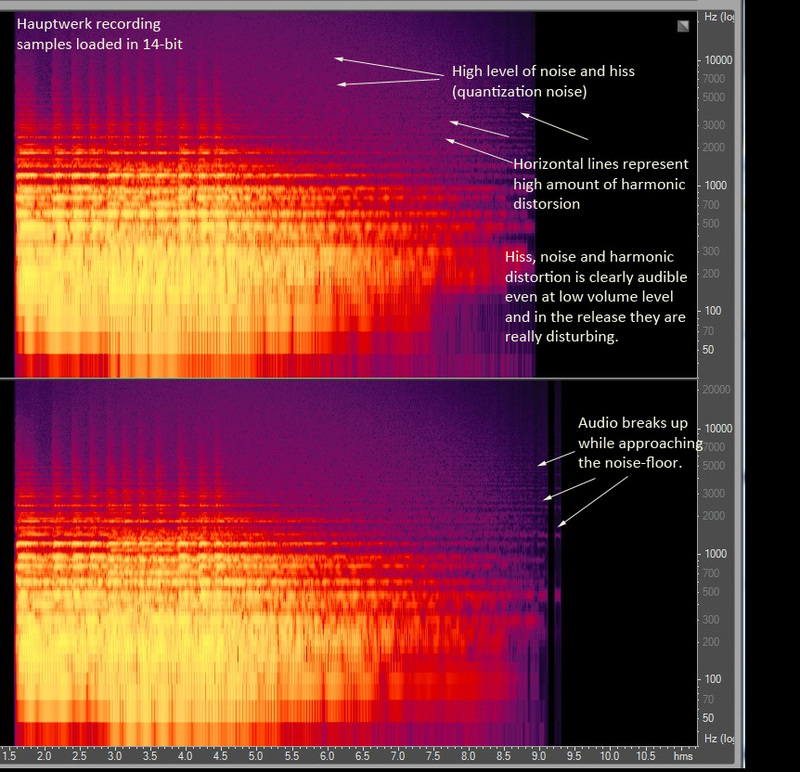 The audio files below are direct Hauptwerk recordings with no further processing (except for a tiny fade-in and fade-out of the example containing the blower noise). 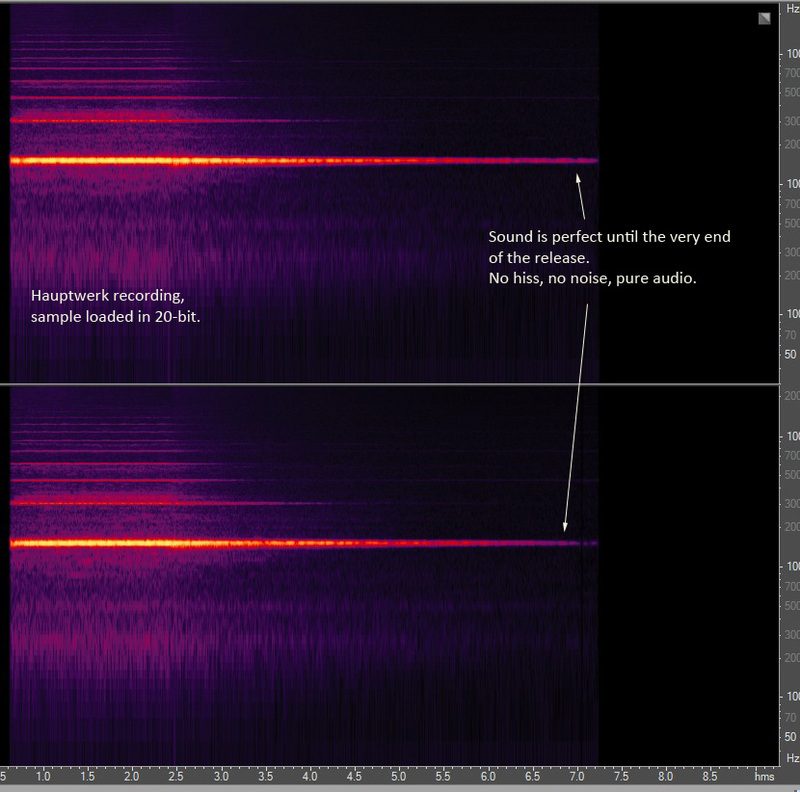 The bitrate is 48 kHz, plain wave format. Sample set loaded in 20-bit depth - everything is OK again! This is my preferred choise for loading sample sets, 20-bit resolution saves a lot of RAM while still retaining the clarity and excellence of the audio. 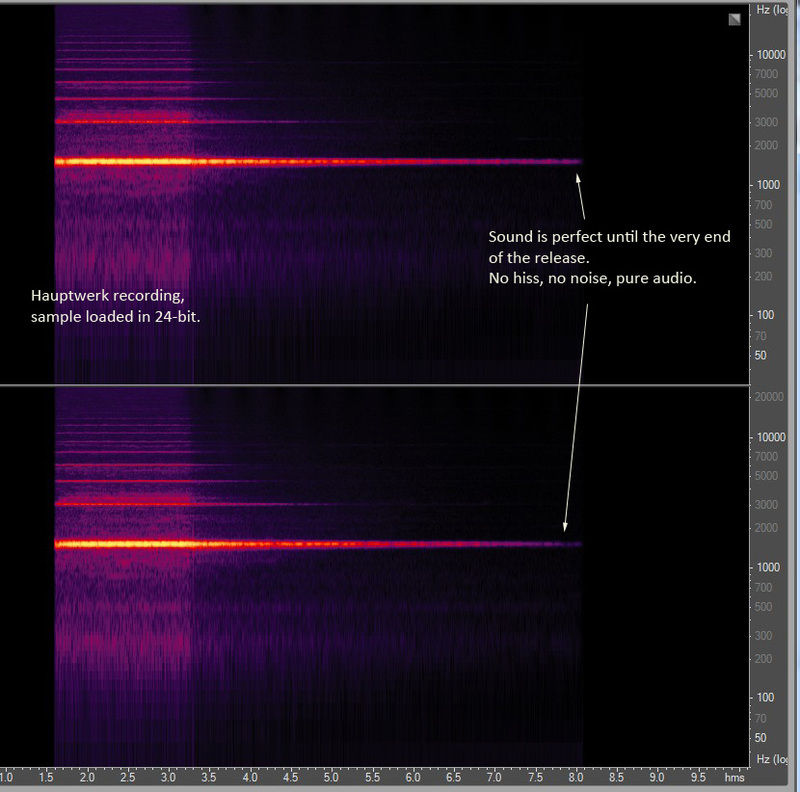 Sample set loaded in 16-bit depth - some quantization noise starts to manifest itself especially in the releases (noise rises as more and more simultaneous pipes are played), the quiettest parts of the releases are not played back (audio breaks up as the noise floor of the 16-bit resolution is approaching). Harmonic distortion is still tollerable. This is "emergency" resolution and can be used if there is not enough resources (RAM) for loading in higher bitrate. Sample set loaded in 14-bit depth - the resolution is not musically usable! 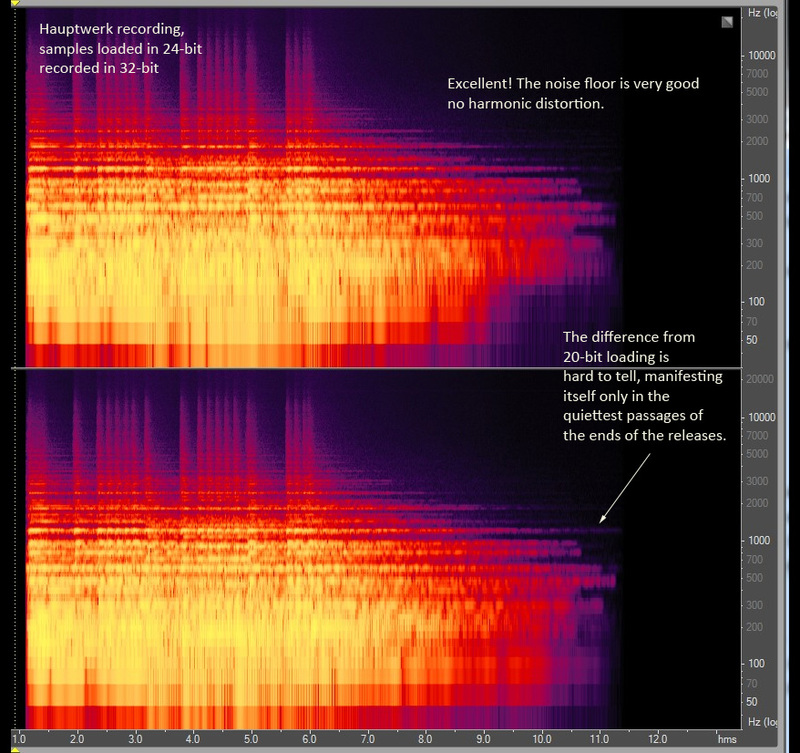 The harmonic distortion is clearly present throughout the music, the digital hiss comming from the quantization (downsampling without the appropriate dithering) is too prominent to allow for musically pleasing audition. 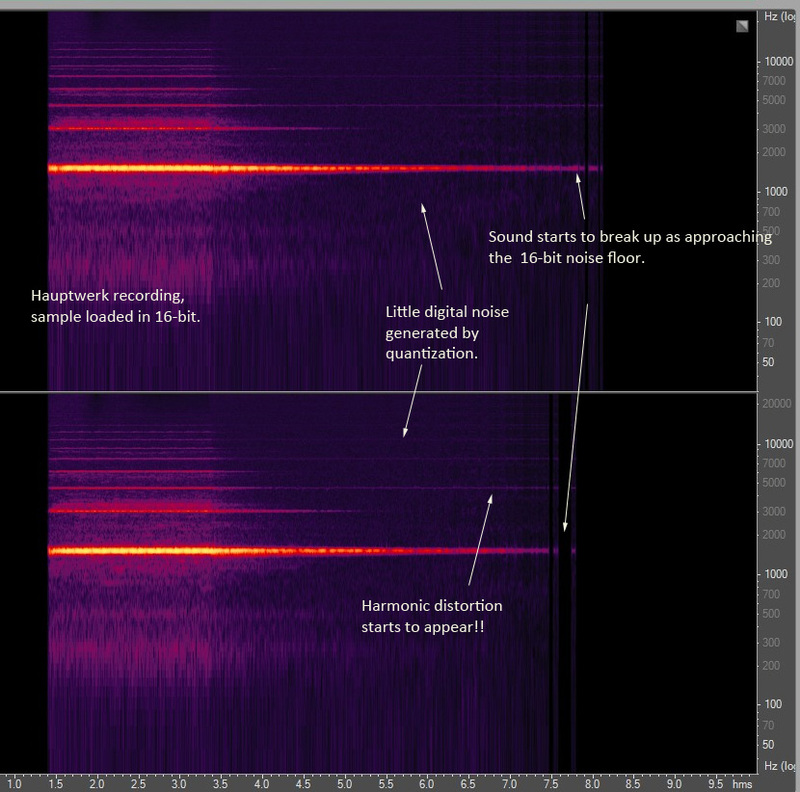 All the examples above were recorded without any blower noise. 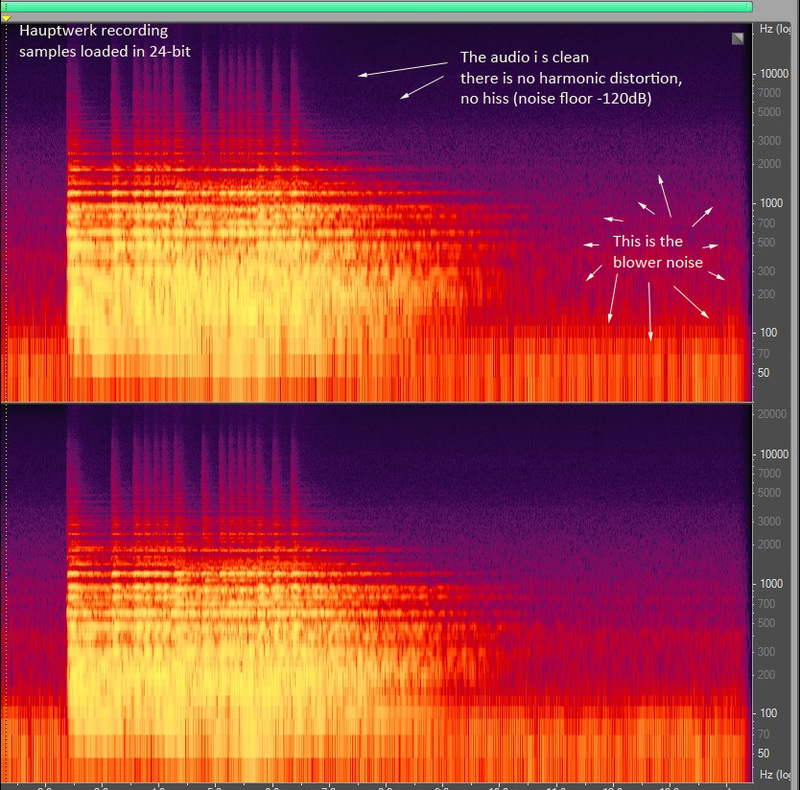 In the last recording, you can hear and see the influence of the blower noise. The second example is using only a single tone - high g or the Waldflute 2 of the Bovenwerk (tremmed). I cannot stress more the importance of loading the sample set in a sufficient resolution. The good choise is 20-bit. Now, you can follow to the post describing the influence of the Hauptwerk interpollation (repitching algorithm) on the quality of your audio output.